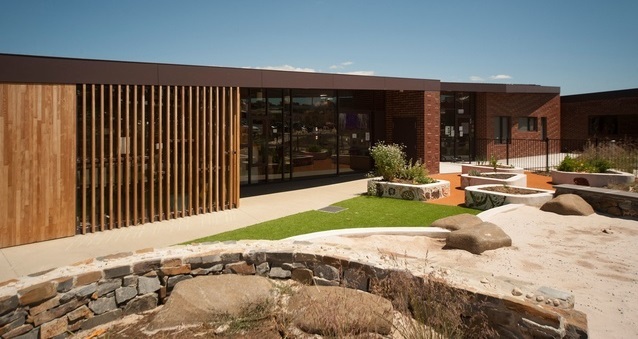 Bridgewater LINC and tagari lia Child and Family Centre has won the most prestigious award for public buildings in Tasmania and is now in contention for a National award. Designed by Liminal Architecture, the building recently won the top Public Architecture Award at the Australian Institute of Architects' 2013 Tasmanian Architecture awards, the Alan C Walker Award for Public Architecture. Read posts and comments on tagari lia's Facebook page. Earlier this month the Chigwell Child and Family Centre won a major award at the Council of Educational Facility Planners International (CEFPI) Australasian Awards. "The play spaces have been designed to foster adventurousness, imagination and complex scenarios using large and small spaces, varied elevations, colour and connectedness with nature", the jury commented, "Early stage consultation with the community was a vital aspect of building the trust essential for this integrated centre to be effective." The Chigwell Child and Family Centre is now in the running for the International Awards to be judged in Indianapolis (USA) in September. CEFPI's website has more about the Chigwell Child and Family Centre. As the Minister for Education and Skills, Nick McKim stated “These awards are testament to the vision of the architects and the hard work and commitment of staff in the Department of Education in working with local communities to achieve such fantastic facilities."